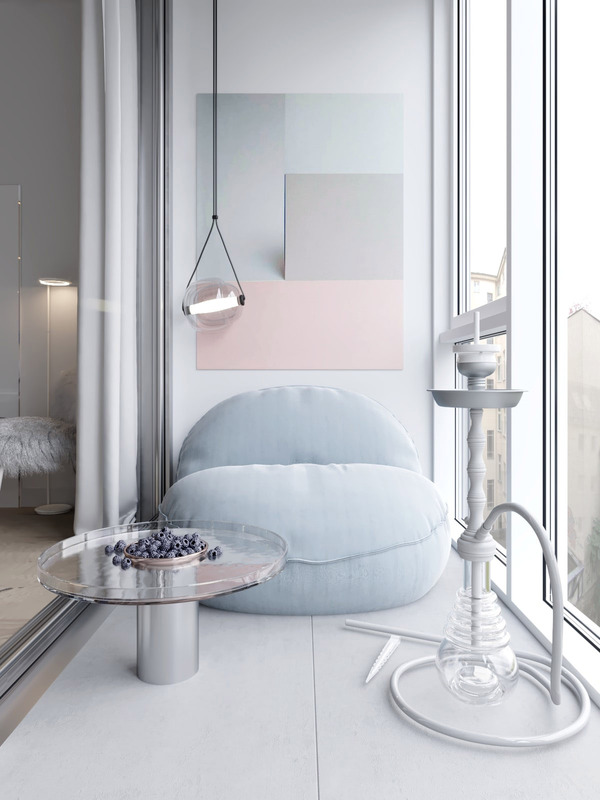 This petite apartment is awash with calming pastel colours, and is filled precious accents around every turn. 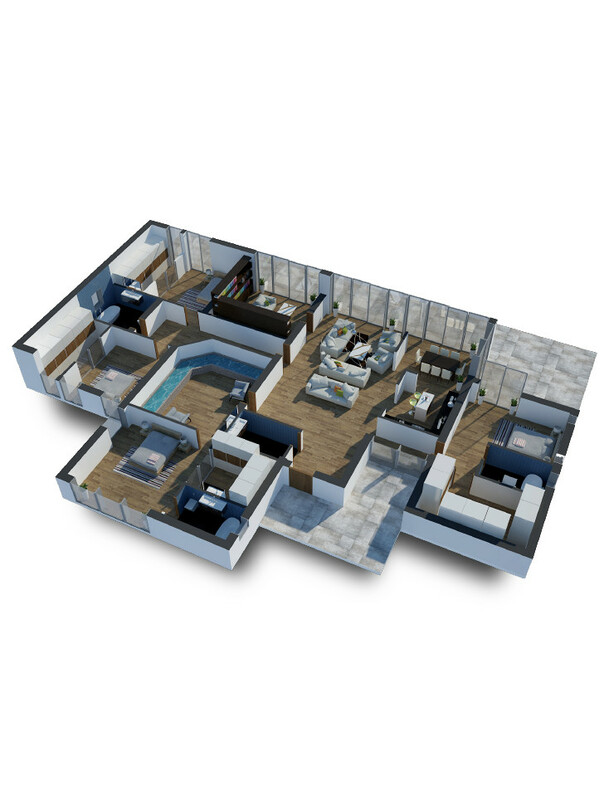 The beautiful modern interior was visualised by Art Partner to include interesting interior detail from any viewpoint. 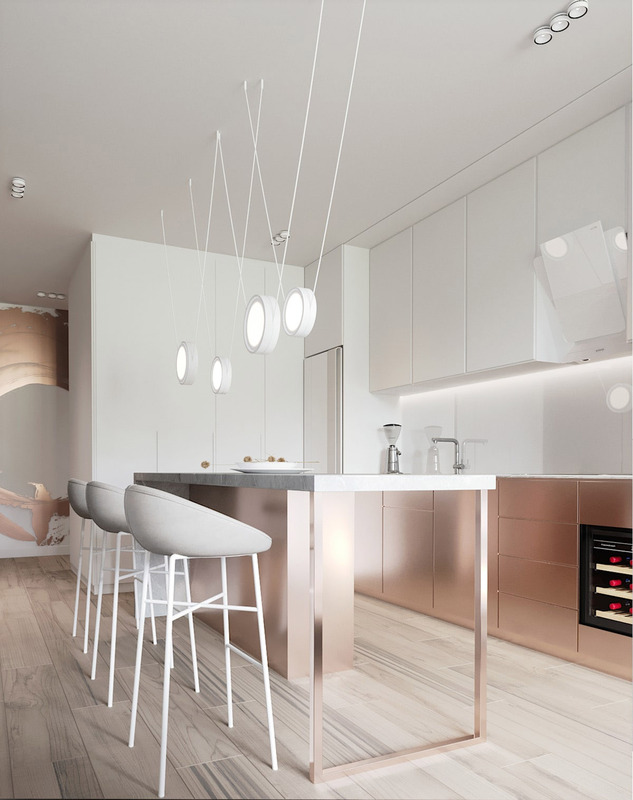 Textured panels dimple plain white walls, a metallic sheen washes over a stunning rose gold kitchen and recessed lighting strips cut through room schemes in entirely unexpected places. 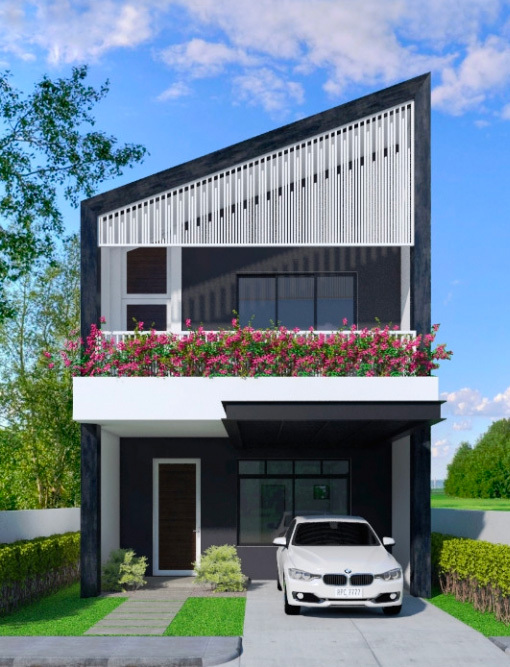 The ethereal palette draws you into the relaxing home, and cosy furnishings, rounded shapes and gorgeous accents make you want to stay. 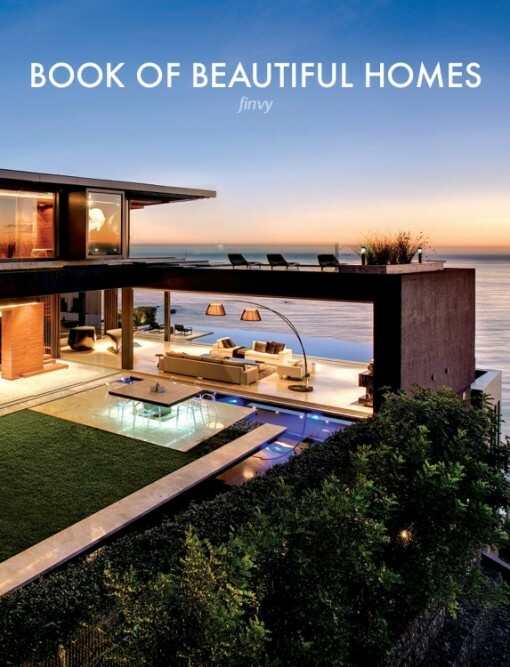 This is one chic and sleek little number that is sure to impress. 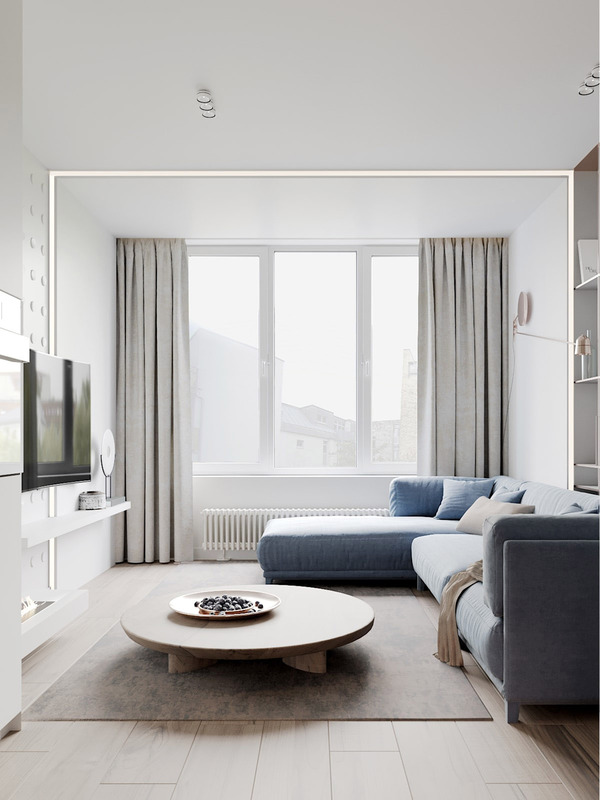 A long pastel blue sofa fills the length of a modest open plan lounge. 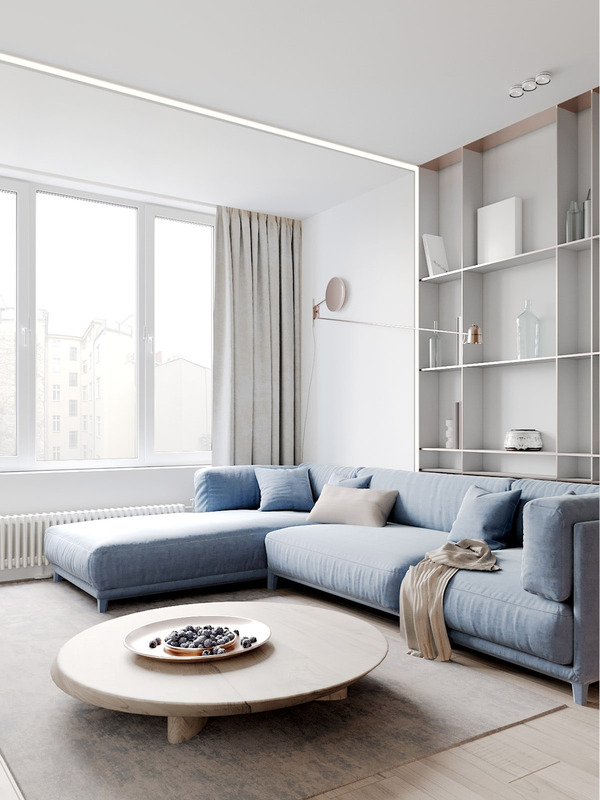 A bespoke shelving unit behind the sofa displays blue glass vessels to subtly colour a white wall. 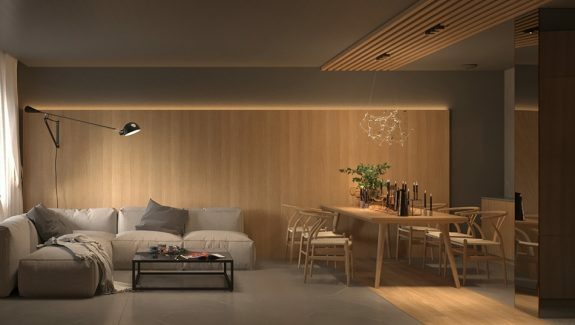 The swing arm wall lamp you see here is the Counterbalance wall lamp by Luceplan. A strip of LED lighting runs up the side of the display shelves, it veers off over the ceiling and runs down the tv wall on the opposite side of the room. The centre of the lounge space is filled with a low-level wooden coffee table, round with gently sloping edges. A table centrepiece of fruit keeps the look natural and wholesome. A mixed pastel hue rug defines the perimeter of the lounge area from the kitchen diner. 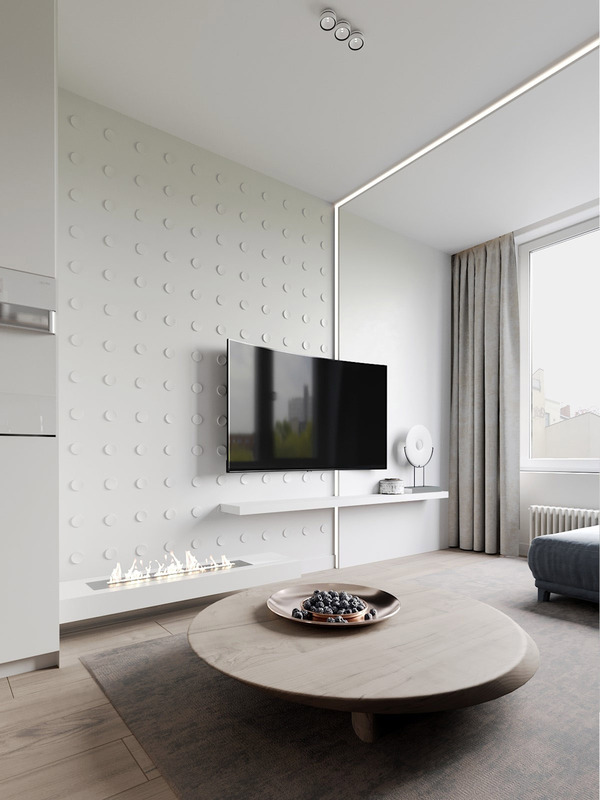 The tv wall decor is comprised of a dimpled white panel against a smoother counterpart. 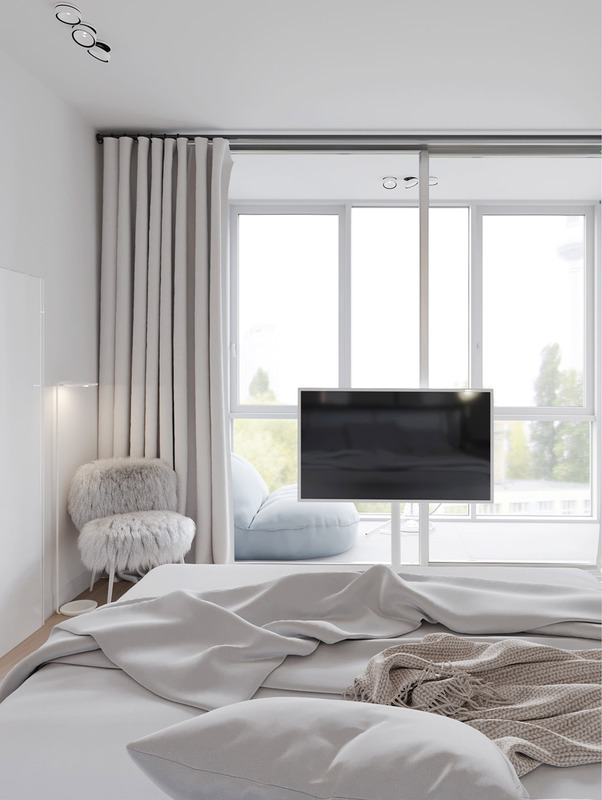 A simple white shelf underlines a wall mounted television. The shelf below the curved tv model is just lightly accessorised, and it’s the offset open flame fireplace that steals the limelight. A tall white unit marks the start of the kitchen run. 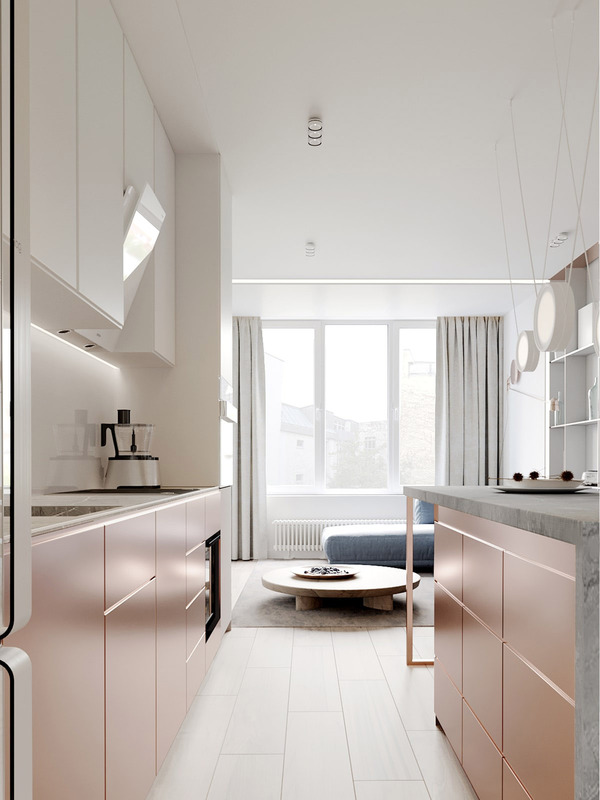 Metallic units bring a stunning rose gold sheen across a one wall kitchen arrangement, and the support column of a breakfast bar. Worktops and wall cabinets are knocked back in plain white to let the stars of the show shine. 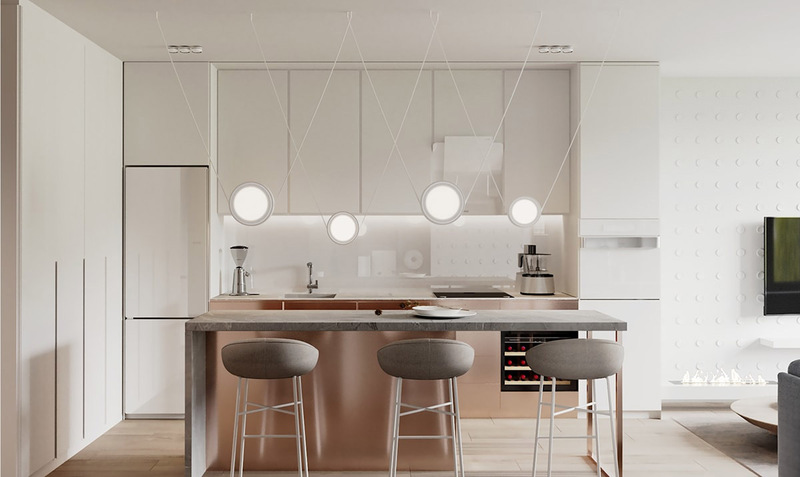 The one wall kitchen with island is equipped for three diners, below an eye-catching modern light design with a line of suspended glowing discs. 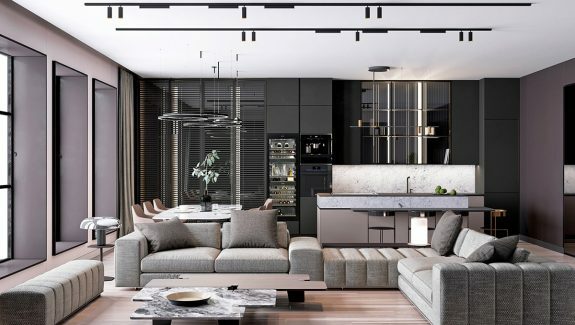 The close proximity of the lounge fireplace makes the kitchen-diner feel extra warm and cosy. Drawers are set into the base of the rose gold breakfast bar support stack. A white kitchen extractor unit blends in with the upper white cabinets. A thin strip of lights illuminate the prep area from beneath the wall units. 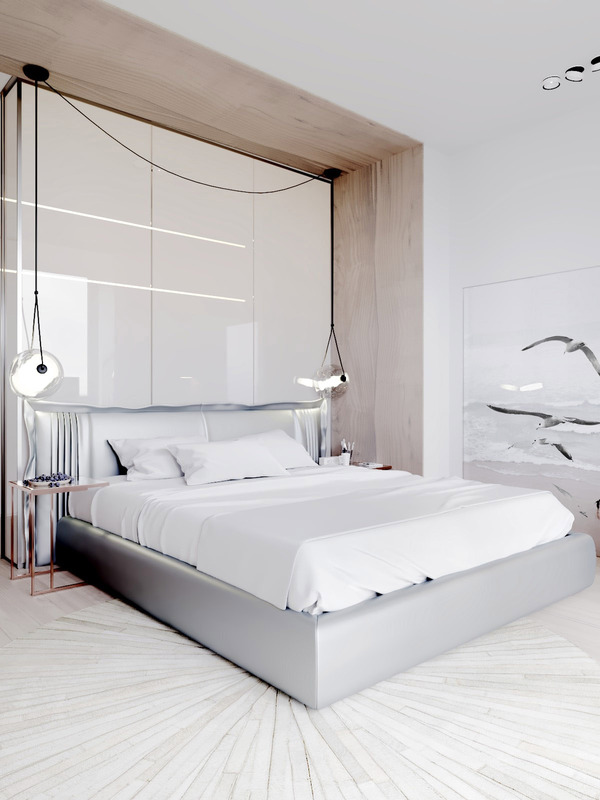 The glow from two globe pendant lights reflect in the glossy white panels clad over a headboard feature wall in the master bedroom. A plush silver grey bed and a round area rug look soft and inviting. 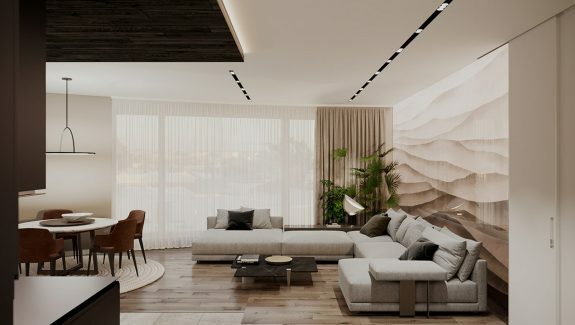 Artwork depicting flying seabirds adds to the serene atmosphere of the airy room. A faux fur covered bedroom accent chair brings a look of warmth to the cool palette of the scheme. 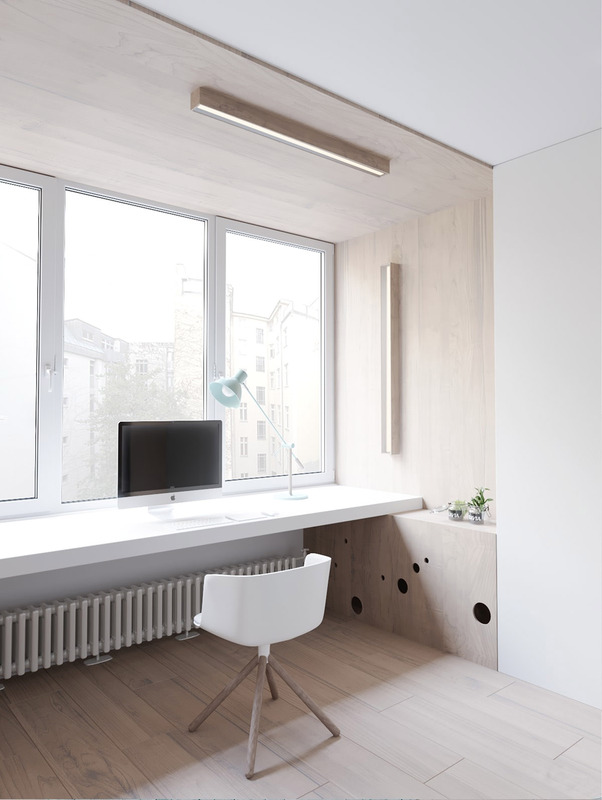 The chair is coupled with a minimalist style floor reading lamp to brighten the corner. Beyond the tv and out through balcony doors we can see a small sitting area. The covered in balcony is home to a soft blue accent chair beneath a globe pendant light that matches the two inside the bedroom. 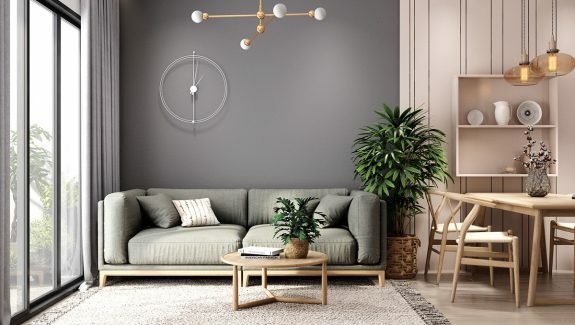 Pastel coloured artwork decorates the wall. A hookah water pipe fills the floor next to a modern glass coffee table. 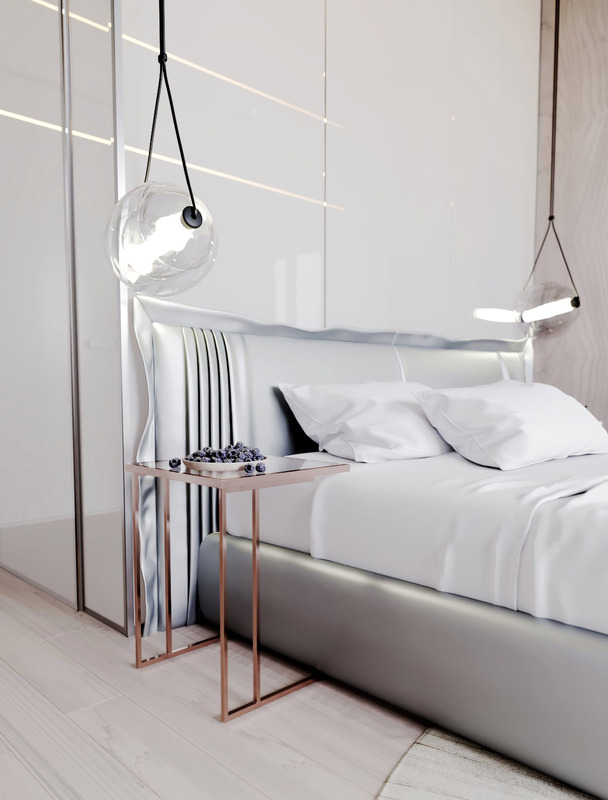 The silver headboard is fashioned like a cushion with pleats at its edges. A small side table hugs around the base of the bed. A double sink bathroom vanity fills a recess in the bathroom. 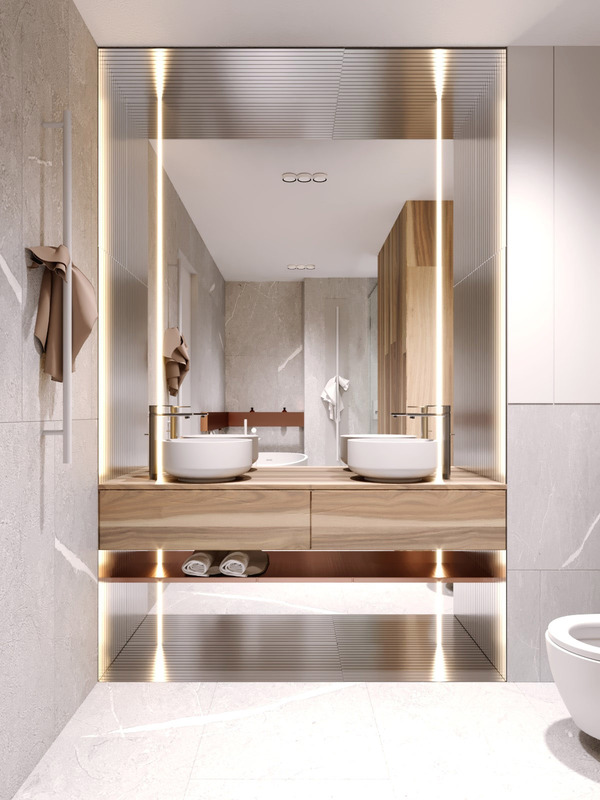 Strip lights cut up the height of the vanity mirror on each side. 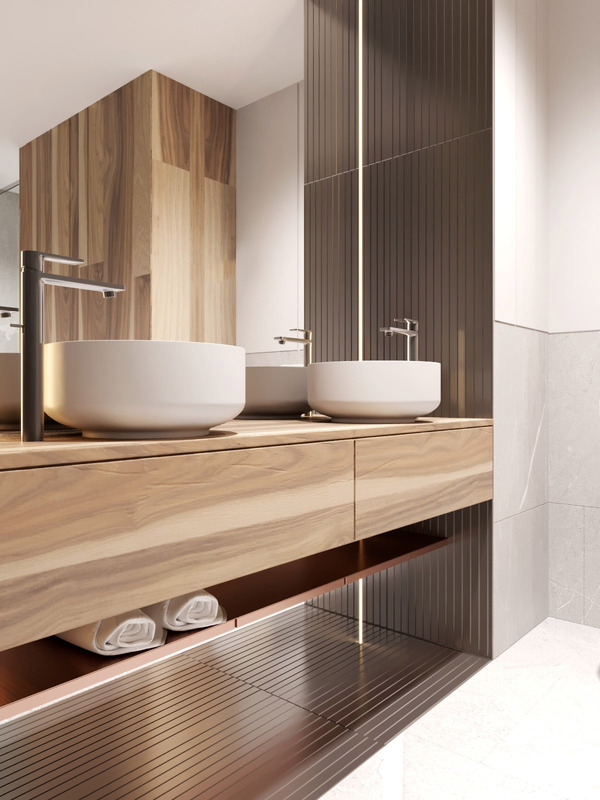 A neat shelf holds spare towels close to hand beneath the twin basins and drawers unit. Ridged tiles that frame the vanity area are reflected into the mirror, creating an optical illusion of added depth. Large marble tiles clad the rest of the bathroom walls and floor. Shallow shelving runs around the corner of the bathroom; it is boxed-in to hold bathroom toiletries close to the tub but out of plain site. 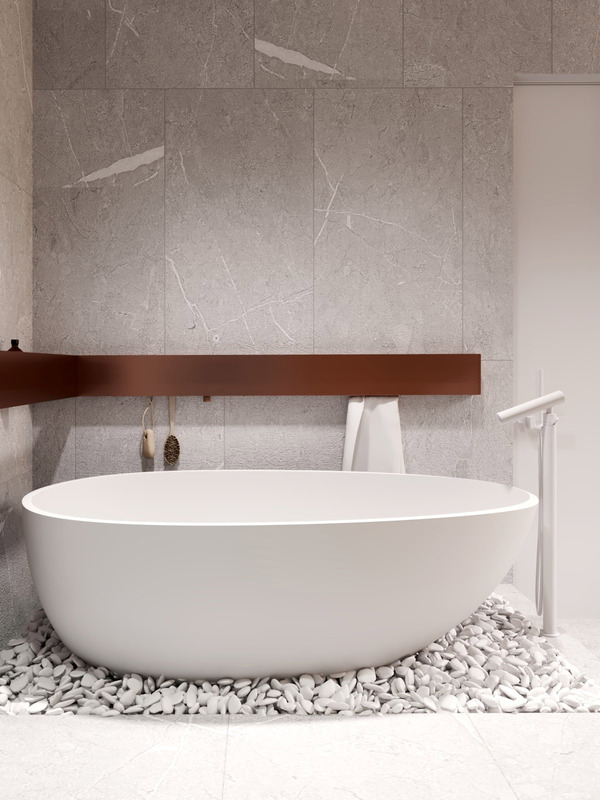 The modern freestanding bathtub has been set onto a bed of white pebbles for a spa-like look. A contemporary white faucet and rinser head complete the white ensemble. 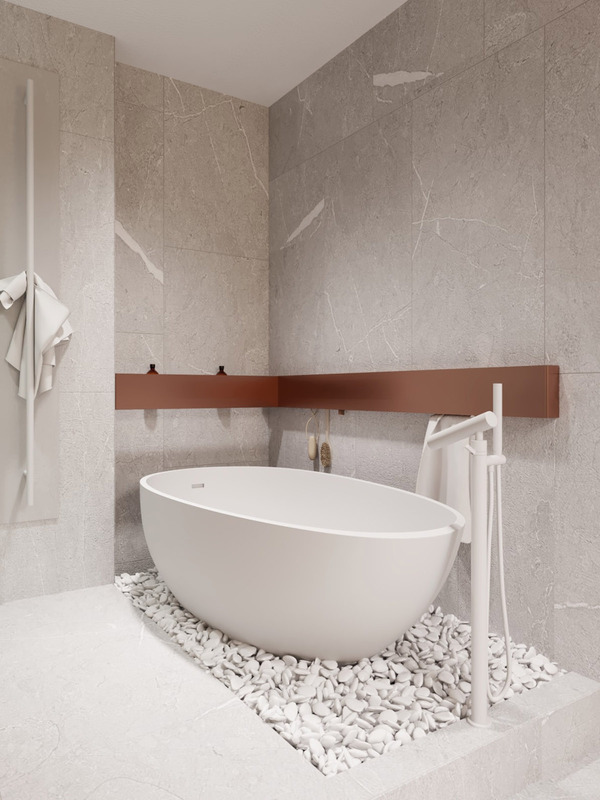 If you’d like to see more ideas like this, check out these other beautiful bathrooms with bathtubs. 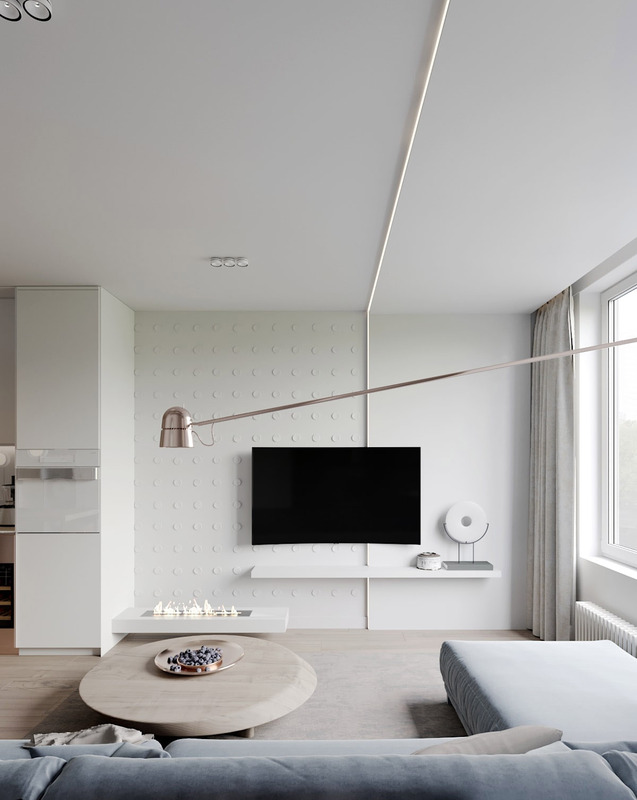 The boxed-in L-shaped shelf is also equipped with hanging hooks. A modern toilet is slightly set back into another small recess. 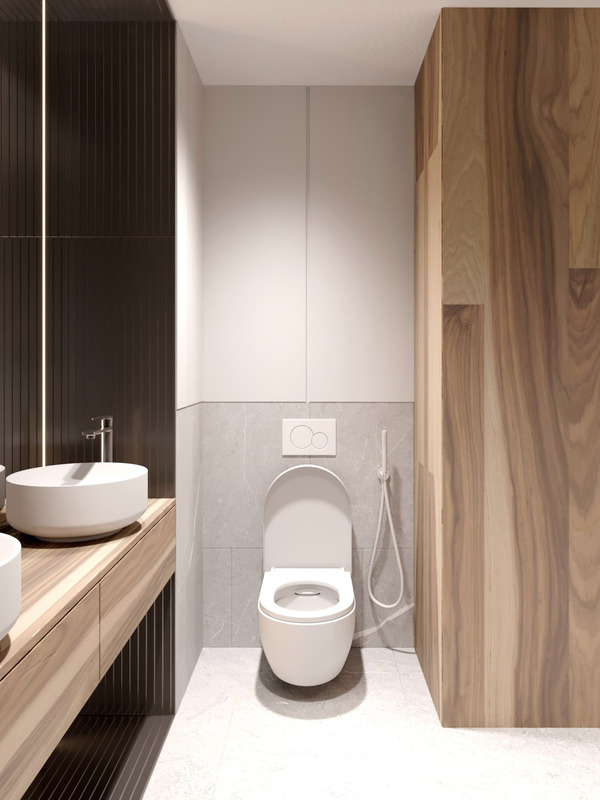 The toilet cistern is concealed inside the wall, behind the tiles and a flush plate. 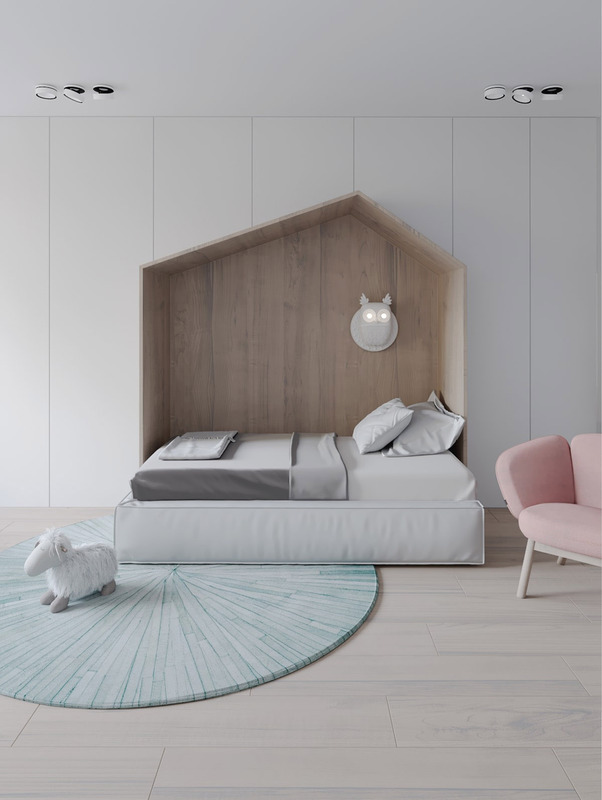 A child’s bedroom is set out in a white and natural wood tone palette, with a light aqua undertone in the area rug beneath the bed and a desk lamp by the window. Fun neon wall lighting says ‘Play’ right above a music keyboard. A kid’s study area has been equipped with a long desktop that is supported at either end by storage cupboards. The cabinet doors have decorative ‘holes’ cut out of them, like slices of Swiss cheese. The kids’ bed shelters beneath a house shaped frame. Owl decor lights the bed canopy. 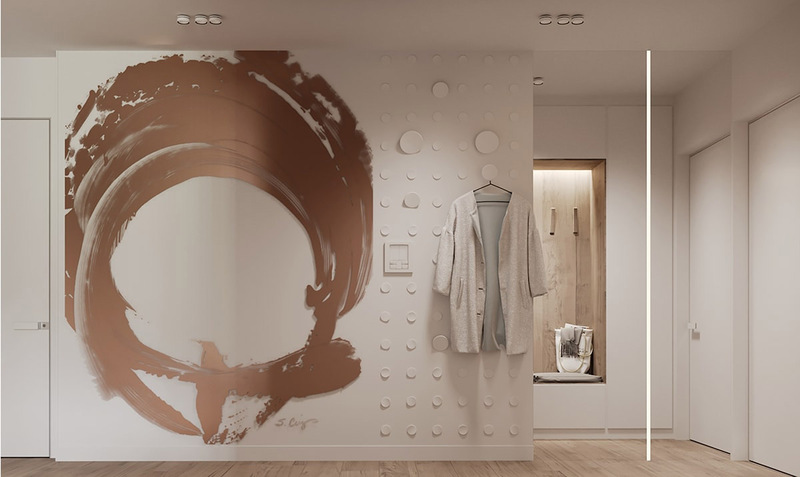 Out in the hallway, a copper swirl covers one wall, next to a textured panel with wall hooks. 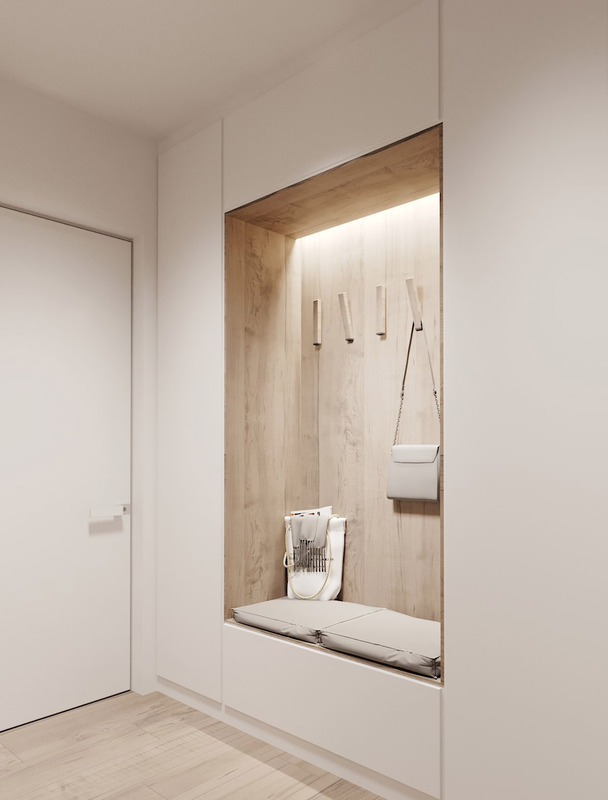 More decorative wall hooks have been positioned inside a hallway seating nook by the front door, perfect for hanging up purses on the way inside.